The Keysight U2781A USB modular instrument chassis is a high-performance 4U high chassis that comes with a 200 W universal AC power supply and a built-in protection circuit. 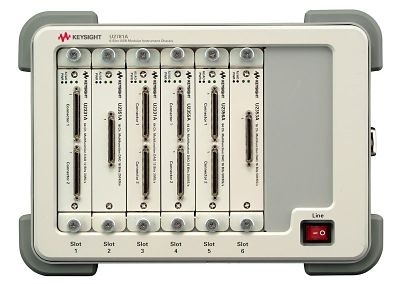 This portable chassis can house up to six Keysight USB modular products. The U2781A targets a wide range of applications in both industrial and scientific environments in the research and development (R&D), design-validation, and manufacturing fields. The primary advantage of this chassis is its synchronization capability between modules. This can help you to lower your cost of testing and accelerate your test system integration and development. 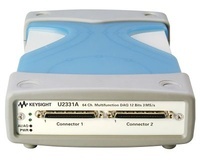 The U2781A is equipped with an internal 10 MHz reference clock for each module slot. There are two temperature sensors to monitor the internal temperature and a built-in fan to maintain the internal temperature. The trigger bus enables the USB modular products to trigger signals to each other. Giving users more flexibility, the U2781A is compatible with a wide range of application development environments such as Keysight VEE, MATLAB, NI LabVIEW and Microsoft Visual Studio.